When you’re pregnant for the first time, people tell you, “Your sleep will never be the same,” and you think you know what they mean. You think that once you’re given this insight, you can prepare yourself for this change in your sleep life. But the truth is, there’s no way you can ever understand the implications of that statement until you live it. What I really didn’t understand was that when they say, “Your sleep will never be the same,” they really mean never. Not just for the newborn stage. Not just when you have toddlers. But never never never never. My little non-newborn-non-toddler-five-almost-six year old Luke is proving that kids will disrupt your sleep well past the baby stage. It turns out that some kids really, really like to sleep with their parents. And maybe that wouldn’t be so bad. Except one thing. I simply cannot sleep with two other humans in the bed. I will lie awake, maybe tossing and turning and maybe still, but mostly definitely awake, the whole time I’m sharing a bed with two other humans. If one human is big and one human is small, it doesn’t matter. If it’s a king sized bed, it doesn’t matter. I won’t sleep. It’s been a while now, maybe two months? In broken sleep language that’s a long time, that Luke’s been silently creeping into our bedroom at night and claiming a spot in our bed. 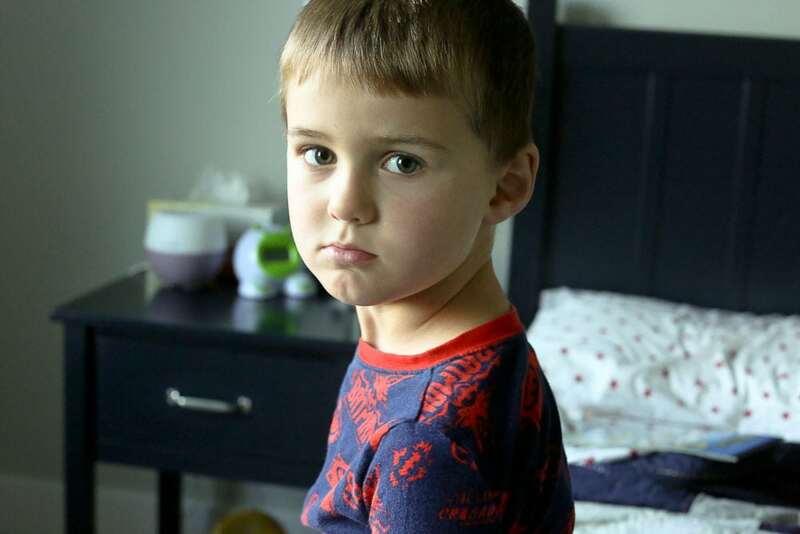 It’s hard to say no to a cute five-year-old who says he’s scared. My mama bear instincts make me want to cuddle him and make him feel safe. He was going through life changes, I reasoned. Starting kindergarten. Big stuff. But I also can’t share a bed with two humans. First I tried bringing him back to his bed, tucking in him again, giving him kisses and reassuring him that he’s okay. A futile tactic as it would only be 10-15 minutes later, and he’d be back. I’m still scared, he’d say. My next idea, since just letting him sleep in our bed was not an option if I want to actually function in life, was to let him stay in our bed with Tim while I move on to sleep in the guest bed. He was okay with this. I barely had to open my eyes as I walked the twenty five steps from my bed to the guest bed, so it seemed like a reasonable solution. This is a phase, I thought. This will pass. And sleeping in the guest bed for half of every night was not a long term plan I wanted to be a part of. Even if I was zombie walking as I shifted beds, it was still broken sleep. Interrupted sleep is not good sleep. And I was starting to feel the effects. So, finally, I sat Luke down and said, “This is what we’re going to do…” I wrote a simple statement at the top of a piece of red construction paper. 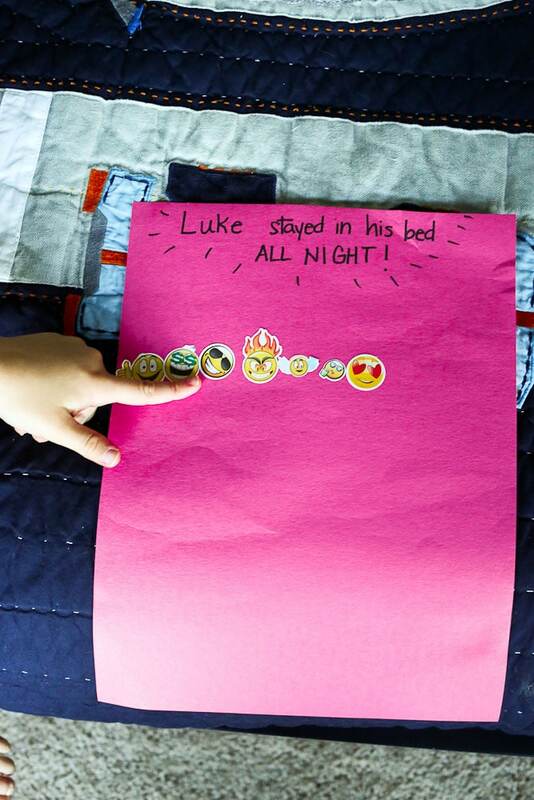 I told Luke that for every night he sleeps in his bed all night, he’d get a sticker. 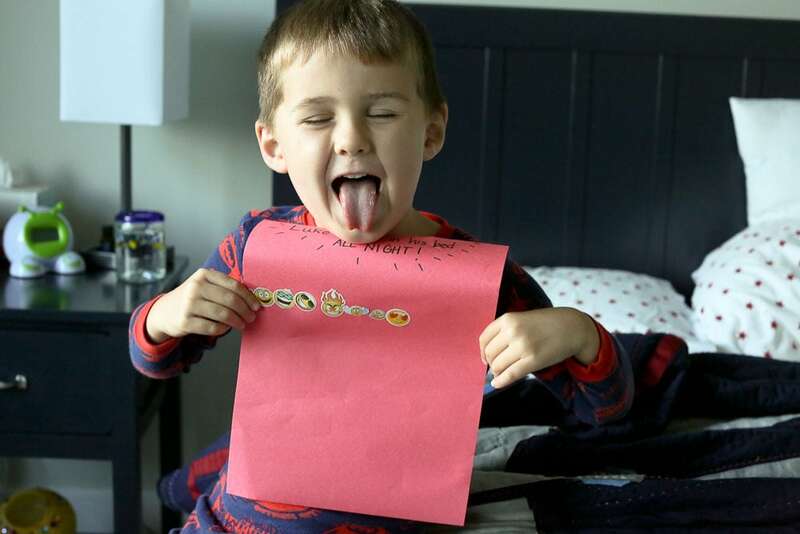 Once he gets 10 stickers, I would take him to the toy store to pick out a toy of his choice. We normally reserve toy buying for birthdays, Christmas, or when they save enough chore money to buy something for themselves, so this is a big deal. Well, I have now had seven glorious nights in a row of uninterrupted sleep. Luke is happier. Maybe I’m a terrible mother for bribing my child to stay in his bed, but what can I say? The promise of sleep is powerful. Sleep. Glorious, glorious sleep. Love this! I don’t think you’re a terrible mother. In fact, quite the opposite. I think you’re a loving, creative mother trying to help her child be independent without punishing him for needing his Mama sometimes. I’m 34 and I still need my Mama sometimes, not that I’d crawl in her bed, but maybe call her when it feels like life is too tough just to be reassured that I can handle it. I love this idea. I’ll be saving it for when my babes are a little older. This is so funny….I just went through the same exact thing with my daughter and the chart worked! However, after a few weeks of no chart we are back to playing bed roulette (no guest room so I sleep in her bed for half the night! Argh!). Guess I better make another chart! How is your son’s food sensitivities? My 4 month old daughter has mucousy stools and removing dairy has helped. Can he eat everything without issues now? That is so good to know. Did he not have dairy after he turned 1? What substitute did you use? He outgrew his sensitivities around 2 1/2. He eats everything now with no issues! ? ?